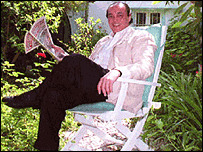 Tycoon Asil Nadir who fled to northern Cyprus 10 years ago to escape charges of theft has vowed to return to the UK to clear his name. BBC News Online finds out how one of the biggest success stories of the 1980s went from the rag trade to stock market darling, and then ended up on the run from the fraud squad. Asil Nadir, a 58-year-old Turkish Cypriot had business interests as diverse as electronics, fruit and hotels within his Polly Peck empire. He became legendary on the stock market, with some shareholders seeing returns 1,000 times greater than their original investment. 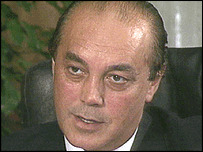 But by 1993, Mr Nadir had fled the UK for northern Cyprus as 66 charges of theft involving £34m hung over him. The charges related to a huge Serious Fraud Office (SFO) investigation. The scandal was so wide reaching that the then Conservative Minister of State for Northern Ireland, Michael Mates, resigned over his links to the businessman. Meanwhile, Mr Nadir took advantage of the fact that northern Cyprus has no extradition treaty with the UK. The former Polly Peck tycoon was born in the Cypriot copper mining town of Lafka in May 1941 and took his first job at the age of six - selling newspapers he could barely carry under his arm. He went onto Istanbul University to study economics - a degree he never completed. By the early 1960s, he had joined his father in England and drifted into the rag trade. The Turkish invasion of northern Cyprus in 1974 provided an unexpected boost for the fledgling entrepreneur. With the economy in ruins the government called on expatriates to help out, which saw Nadir take over a clothing factory in Nicosia, previously under Greek ownerhsip. He began exporting to the Middle East and by 1980 his £260,000 London fashion trade business, Wearwell, was valued at £12m on the stock exchange. From Cyprus he moved on to Turkey and into fruit. And that was where the Polly Peck empire was born. The group's shares started on the London stock market at 5p but doubled and doubled again as profits took off, reaching a peak of £35 in just a few years. Mr Nadir then bought a TV factory in Turkey, hotels and leisure complexes and even a bottling plant for Turkish mineral water. In the 1980s, he entered the record books after presiding over the most spectacular share price rise anywhere in the world. In the summer of 1990 he was named 36th in the Sunday Times Rich List. But just weeks later a bankruptcy petition was lodged against him by his own stockbrokers demanding payment for £3.6m worth of Polly Peck shares Mr Nadir bought in September. The firm collapsed in 1991 after SFO investigators began probing Mr Nadir's finances - an investigation which saw him flee the country in 1993. Now the tycoon is vowing to return to the UK to clear his name, claiming accusations that he stole more than £30m from the company are "baseless" and that the SFO abused its powers, making a fair trial impossible.